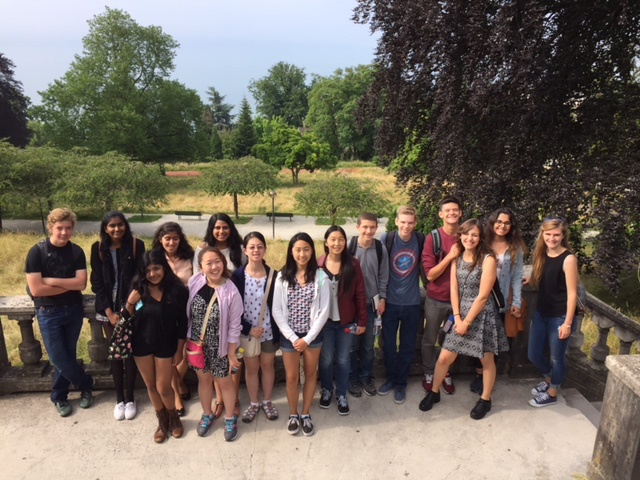 Several upper school students traveled to Switzerland over the summer to meet with their friends from College de Gambach in Fribourg and tour several spots around the country. The students spent the first day getting situated with their host families. The students and their buddies from College de Gambach were very excited to greet one another after a long time apart. Later, they journeyed through Fribourg, climbing up the tower in the city’s cathedral and riding on a funicular, a historic tram that runs on waste water. Over the next few days, the students spent more time with their buddies and attended classes in a variety of subjects, including math, German and music. “We went to a music class where the teacher showed us different types of Swiss music, from pop to traditional to yodeling,” said Daphne Yang, grade 12. “And then we sang American songs such as ‘I’m Yours’ and ‘Hallelujah’ to end the class.” Their visit to the Cailler chocolate factory was a highlight, as the group sampled many of the factory’s delicious treats and learned about the history and spread of chocolate after its discovery in the New World. They later made their way to the castle at La Gruyere, where they spent much of the afternoon exploring the centuries-old structure and visiting the surrounding restaurants and shops.